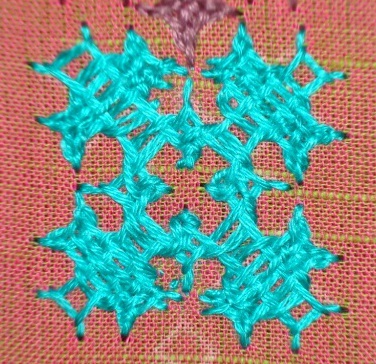 After writing a tutorial on woven kutch work , I got inspired to do a yoke for tunic with small woven kutch work motifs. These woven motifs are worked with pointed corners. The first motif is here. This tutorial is another small motif. I am not writing the basic kutchwork tutorial here, because they are already available on the net. This is just a detailing of this particular type of woven kutchwork motifs. 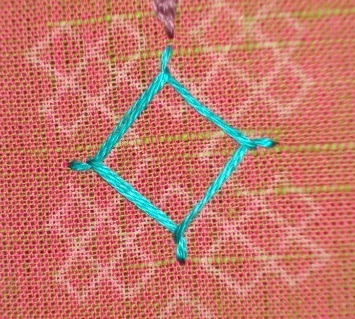 In this first step, the centre square shape is worked with the anchoring basic stitch. The second step is to stitch the anchoring bars around the central square. These two steps are done separately, no connecting thread , after finishing each and every bar/square, we just go to the back of the fabric, and start again for the next bar. Remember to work these bars / square correctly. This is the starting point. This anchoring base stitch is a continuous one. This gives the shape to the pattern. 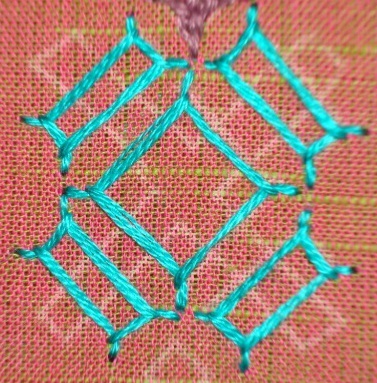 This stitch is easier if the bars/ square are worked in a precise manner. The inter lacing starts at this step. I have left the weaving for the last step. We are securing all the corners in this step . Notice the journey of the thread – the thread goes around at the pointed corners, and the same thread just turns at right angles at the inside corners. This step the thread interlaces each and every bar individually. Till this step, the working is the same for a normal kutchwork motif and a kutchwork woven motif. All the perpendicular bars are woven first- picture with the woven bars. Just a step 3 this thread journey is also a continuous one. Take out the thread at the starting point, start weaving, just move up and down the already worked threads to get the woven effect. This tutorial is just a guide, to be used for reference. I was working on the yoke as a part of the tunic and not as tuitorial steps. Still I ‘ll be happy to elaborate, if any one wants. If some one wants a tuitorial for this motif also, give me some time I ‘ll work on it. Your feedback would help me to learn. Very neat finish. Good work . Thanks Chitra, I follow your blog everyday. Thanks, Chitra. This tutorial helps people like me, who know the basics, but who are not aware of the variations and advanced features of Kutch work. May I know why you have used pointed edges instead of the regular small stich taken at the back like herringbone? Is this mandatory for this variation you have demonstrated? I too am a keen follower of your blog. Is it possible to show us a nice pattern that can be used in a saree of lehnga, based on this tutorial? I a really loving working on the pattern got from you, and hence this request. Or, if you have already posted an entry for a design that uses this method, please let us know. I am starting kutch work for my daughter’s lehnga next week, and would love to use this method and your patterns. These motifs can be worked both with pointed edge and curved edge. I was working on some kutchwork patterns , got bored with the same curved edges, turned to this pointed edge. that’s all! After I started writing the instructions for woven kutch work motifs, I have been having some ideas going over on my head without any focus. 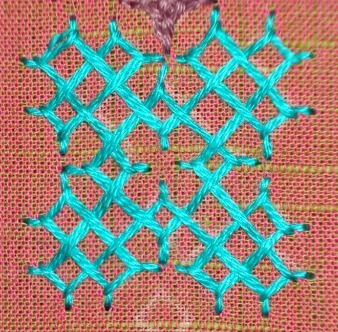 I had started a yoke with these motifs, which Iam posting now as reference for others. I can definitely start thinking on patterns with these motifs. can you be more specific about your requirements? So that I can work better. Hi Chitra, I have just come across your Kutch tutorials. They are great for designs and techniques beyond the basics. What is the technique for getting the pointed corners/edges? 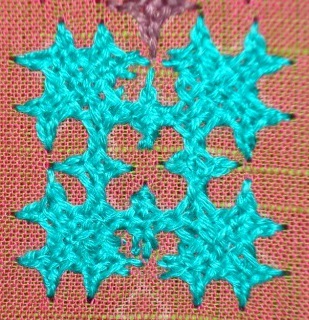 Shantisal, the edges are made similar to the working of Cretan stitch. just maintain the rhythm . Thanks ,Chitra for the detailed and prompt response. I like the way you create geometric patterns. I can use small motiffs for the lehnga. If you have a continuous pattern , a big one that can be used for a saree border, I would be keen on trying it out too . The pattern I got from you is really wonderful – I mean the one I am currently using in a saree. I am 50% thru with it. About your requirement- are you keen on woven motifs? or will it be ok for normal kuthcwork motif too? After knowing these, I’ll need some time to design these. I saw the picture of your WIP . waiting for finale. All the best for your efforts. 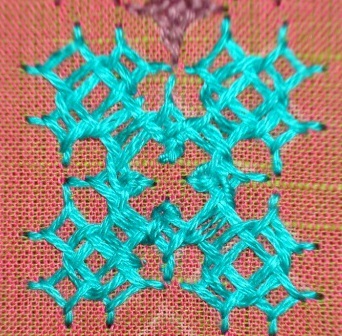 My preference would be for the woven motifs, based on the two tutorials you have presented. There are quite a few patterns on the regular Jutch work, in internet as well as in books. I ‘ll start working on them. lovely indeed. pls put up some worked yoke designs 4 maxi.